When I lived in the States and worked in telecommunications, I had a boss, who pushed hard. In the long run, I learned a lot from Terry. What I remember and use to this day, is his message to never do anything for one reason. I am always trying new things. It may be to enhance a skill that would make me a better programmer, learn a new technique in Photoshop. Maybe I’ve been asked about shopping carts over and over, for example, and it would behoove me set up a Woocommerce shop. That way, when divine timing occurs, I’m ready. Recently someone called me about setting up a WordPress.com website. I only have experience with self-hosted sites. I referred her to someone else, but then felt— why was I not willing to have that experience? Muddling through my resistant mind, it occurred to me that I just go for it. There WAS more than one reason. Learn WordPress.com for the sake of new knowledge. Ability to provide support sometime in the future. Easy way to try out a non-Genesis Theme. It’s always good to have a on-line resumé and I recently had an opportunity to make a Video Interview. I really wanted to try out TwentySeventeen after a Meetup Group colleague showed me what she could do. Synchronistically a friend asked me to redo his website, and, the opportunity to use the theme is perfect. That release will happen in the next month or so. 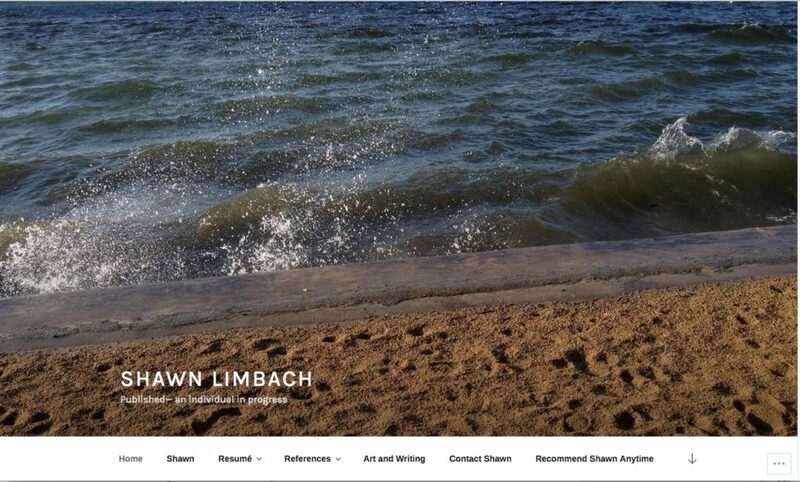 In the meantime, here is the homepage of Shawn Limbach. Published— a person in progress. The cover is an image of Okanagan Lake in Penticton, BC. I mixed mostly natural photos I took with technology images from pixabay.com, added a Facebook feed and testimonials from the Strong Testimonials plugin. What I love about this theme is that the front page can be a concatenation of any of the sub-pages. If a sub-page uses a feature image, then the image is seen while scrolling through the front page. Besides the Okanagan Lake image, you’ll see a couple of cool mountain shots from a couple of road trips through the Canadian Rockies.